Original roof assembly: concrete deck, 2-1/2 inches rigid insulation, coal-tar and gravel, and BUR and gravel roof assemblies. Existing roof assembly approximately 32 years in age. 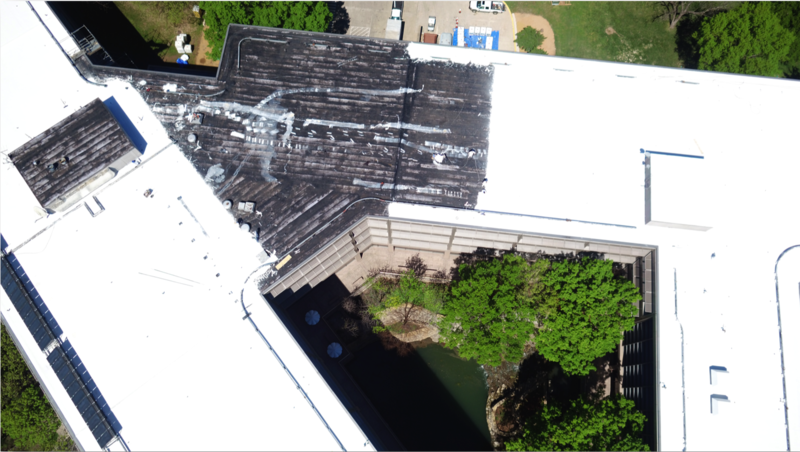 Experiencing base flashing problems and splitting of the field membrane causing water infiltration into the corporate headquarters building which houses 3,800 employees. 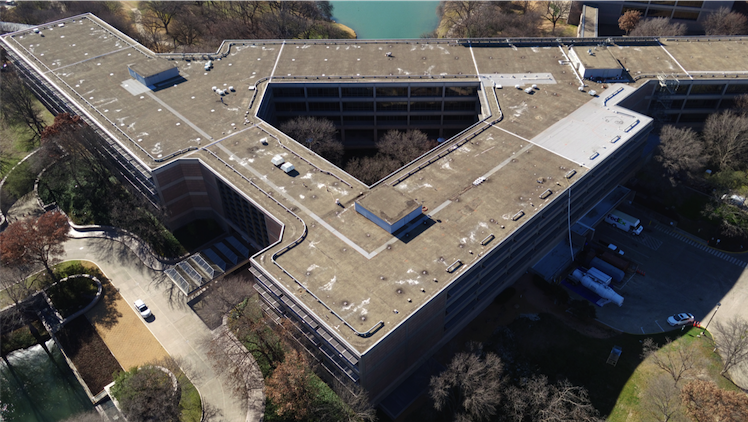 Originally, Frito-Lay wanted to completely remove the existing gravel coal-tar & BUR roof assemblies and install an energy efficient TPO roof assembly. The disruption to the building occupants, grounds and controlling of dust and debris from entering the beautiful lake, which goes underneath the facility along with the cost of 2 million dollars made this prohibitive. Western Colloid presented a customized specification that would eliminate the removal of the existing roof assemblies and save Frito-Lay over one (1) million dollars. The Western Colloid specification allowed the contractor to remove the loose gravel, apply a flood coat of asphalt emulsion with glass embedded into it. Then an additional pass of emulsion with a ply of tough polyester fabric embedded. Once cured, the system was surfaced with Western Colloid’s ElastaHyde acrylic coating reinforced with and additional ply of polyester fabric. 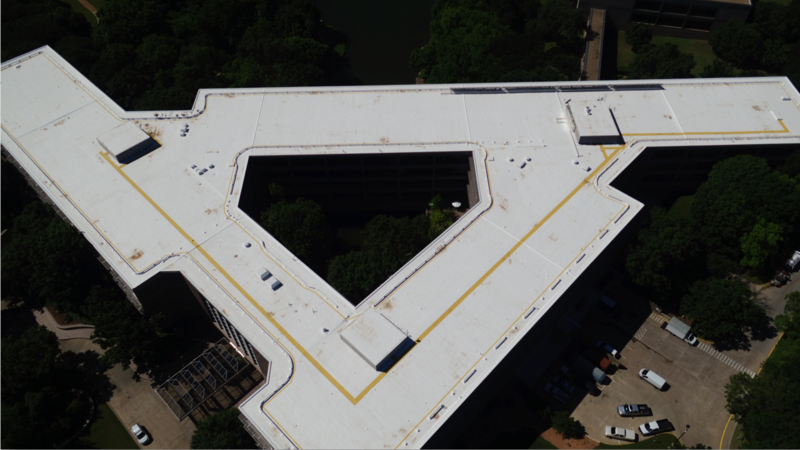 Western Colloid SWS850 Seamless walkways were installed as a OSHA warning line ten (10) foot from the edge along the 4,000 LF of the four story, which does not have a parapet. The contractor did an exceptional job considering that the roof drains emptied directly into the lake. Weather conditions had to be monitored continually to allow a safety factor for the curing before any rain events. 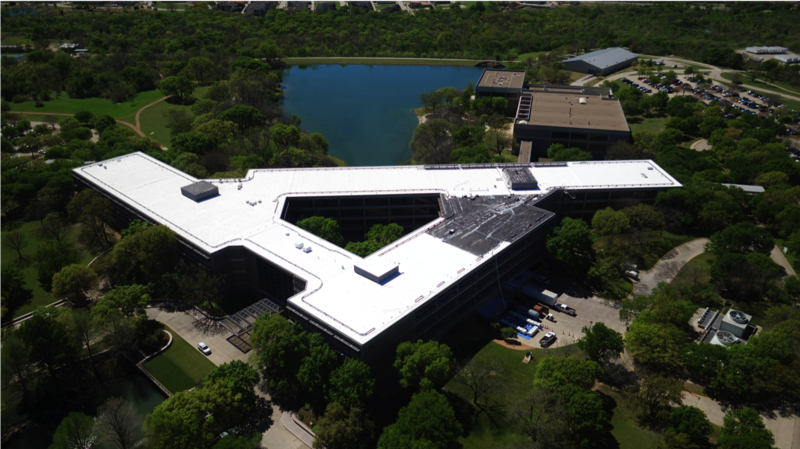 The Western Colloid system achieved the reflective, energy saving roof assembly that Frito-Lay wanted and also provided them additional savings in the form of tax benefits.